My husband and I made a trip stretching from Pawleys Island, SC and up through the Outer Banks of North Carolina earlier this summer. 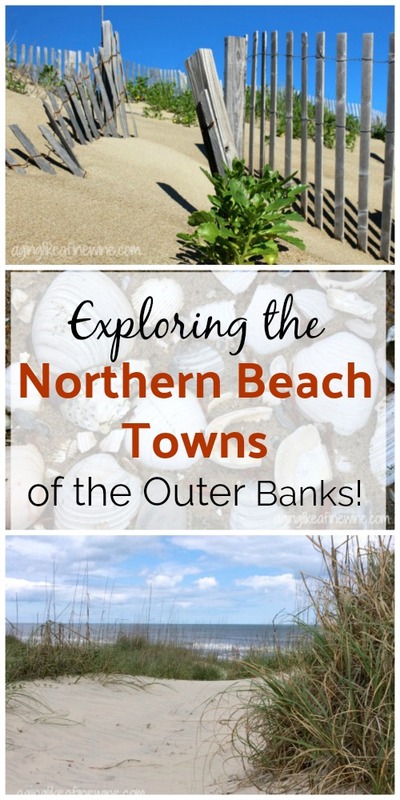 The third and final portion of that trip… the Northern Beaches of the Outer Banks is here! Our last day on Hatteras Island dawned with cloudy skies and a light rain. Today we’re leaving this island to make the short trip to the Northern Beaches of the Outer Banks which consists of the communities of Nags Head, Kitty Hawk, Kill Devil Hills, Southern Shores, Duck and Corolla. Our first stop was at the Froggy Dog for breakfast. We chose to go with the special of the day, which was 2 large biscuits smothered in sausage gravy with chicken fried chicken on top. Oh, my gosh, sounds fattening doesn’t it?? It was comfort food at its best and there was enough of it to satisfy the heartiest of appetites. After filling our stomachs, we hit the road, (the road is Highway 12 which is a two lane road that extends the length of the Outer Banks), on our way to the Beach Haven Hotel in Kitty Hawk. Beach Haven is a charming, quaint local motel. 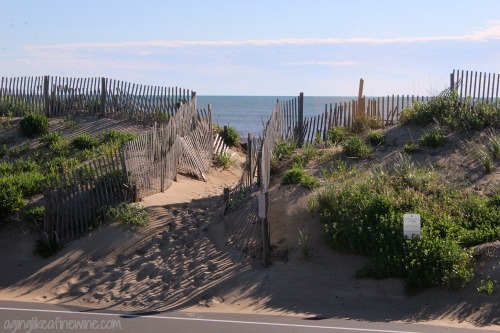 The beach lies directly in front of the motel across narrow Highway 12 and over the sand dune. It wasn’t fancy, but our room was very clean (super important to me) and the manager was friendly and accommodating. In fact, the entire motel grounds were as neat as a pin. After getting all checked in, the day ended with an invigorating walk on the beach. Beautiful! The next day dawned bright and sunny, a welcome relief from yesterday’s clouds and rain. Our day started with a quick stroll to the top of the dune to get a view of the ocean up close and personal, then off to breakfast at The Good Life. After breakfast, we hit the road again to drive to familiar territory, the quaint town of Duck. One of my favorite things about Duck is the boardwalk, extending along the full length of Duck on the sound side. Sometimes it winds past cute shops, other times only the sound, trees and lapping waves are your neighbors while on the boardwalk. We stopped at one of the shops and indulged in a donut on a stick. These are made while you wait and are nothing less than delicious. 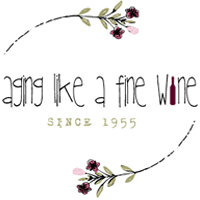 The name of this cute shop is, let’s see…. oh yes, Donutz on a Stick! The following day dawned with a bright blue sky and an ocean breeze. Paul and I were up and out the door early to venture across Highway 12 and over the sand dune to the beach. Today’s goal… find sea glass! We weren’t very successful in our sea glass hunt, finding only one small piece of green. The bigger prize turned out to be watching a small pod of dolphins as they swam and played close to shore. That made it the perfect start to our day. Watch closely and you’ll see the dolphins in this video! The plan for the rest of the day – Jennette’s Pier and Manteo. Jennette’s Pier is very unique. It’s an educational pier, a 1,000-foot long concrete pier that’s operated by the North Carolina Aquarium. And what did we see from the pier? Yes, dolphins! It’s obvious I love watching these creatures, isn’t it! There were also several people fishing and a surfing competition was going on close by. When we left the pier we headed to Roanoke Island. Do you remember your history and the story of “The Lost Colony”? If you do, you also probably remember that it was Roanoke Island that the colony disappeared from. Today on the very site that the story unfolded so many years ago, a play is performed every summer giving new life to the story. The occurrence is briefly described on The Lost Colony website: “In 1587, 117 English men, women, and children came ashore on Roanoke Island to establish a permanent English settlement in the New World. Just three years later in 1590, when English ships returned to bring supplies, they found the island deserted with no sign of the colonists. After nearly 450 years, the mystery of what happened to the colonists remains unsolved.” We didn’t watch the play this summer, but we did see it a couple years ago when vacationing here with family. This is something you definitely want to see when visiting the area. It’s a great way to expose your children or grandchildren to some American history. Roanoke Island is only inhabited by two towns, one is Manteo and the other is the small fishing village of Wanchese. 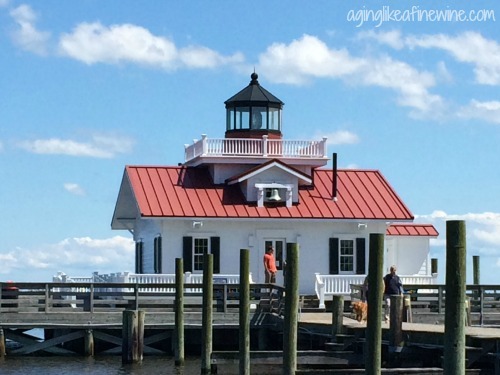 Downtown Manteo is right on the waterfront and offers a selection of boutiques, gift shops, and restaurants, plus the Roanoke Marshes Lighthouse. We enjoyed strolling hand-in-hand along the waterfront and checking out some of the shops before making the short drive north in the direction of our motel, stopping at Tortugas Lie for dinner. This is another local restaurant that was featured on Diners, Drive-Ins and Dives. Fish tacos spoke to Paul and I today, mmmm good! All good things must come to an end and our trip will be ending tomorrow. Today was spent browsing local shops for gifts to take home with us. Our last evening was spent walking along the beach from our motel to the Black Pelican. 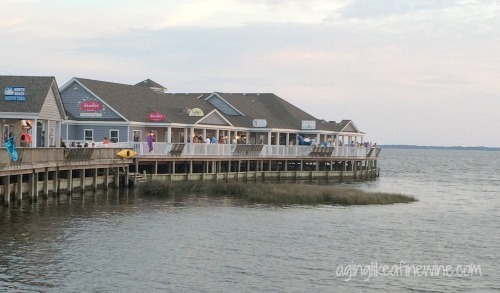 This is one of my very favorite restaurants on the Outer Banks. And once again it has been featured on Diner’s, Drive-Ins and Dives. I’m seeing a pattern here! Today we say goodbye to the Outer Banks along with its ocean breezes, beautiful sea, and sound. The drive home takes us 6 hours with no stops, and that’s not happening. 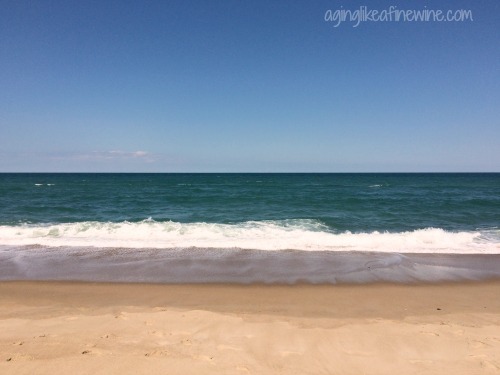 So good bye to the Outer Banks for now, but we’ll be back for the same reasons so many people fall in love with the area when they visit: the beaches and sand between your toes, the sunrises and sunsets, salty air, relaxing atmosphere and great food! Thank you for reading about our trip to the northern beach towns and for putting up with my videos! You can read about our adventure on Hatteras Island in the Outer Banks here. I hope it’s sparked your interest in visiting there soon. Don’t stop reading here, catch the blooper at the end. Fishing, whether from the beach, the pier or a boat, it’s all good! This post will be shared on some of the fantastic link parties found on my Where I Party page! Thanks for welcoming me to your site. I enjoyed reading about the coastal visits very much. 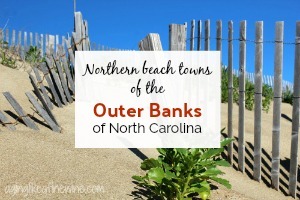 Thank you so much for stopping by and reading about our trip to the Outer Banks! The Outer Banks are next on my list! We went to Charleston this summer and spent some time at Sullivan’s Island and the Isle of Palms. There are so many quaint seaside towns to explore all through the region. I love quaint seaside towns! Let me now what you think of the Outer Banks! Thanks for stopping by.. This looks like a heavenly getaway. Sea and sandtoes equals heaven. It looks like you had an amazing time. Congrats. Thank you Leanna. We did have such a good time, I’m ready to go back! It’s somewhere we love to go. I hope you get to visit one day. Thank you for stopping by! I love that area, need to visit again soon. Thank you Teresa for linking up and co-hosting at the #BloggingGrandmothersLinkParty. I shared your post on Facebook, Pinterest, and Twitter. Thank you so much Dee. 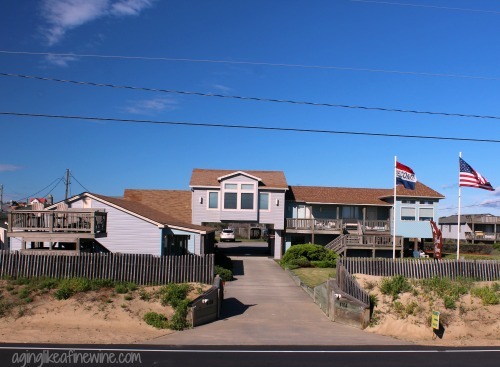 We love visiting the Outer Banks and talk about buying a home there one day. Thank you for sharing! What a beautiful area Teresa. My husband and I have visited the US several times but not to Carolina it looks lovely. Thanks for sharing with us at #BloggingGrandmothersLinkParty and have a beautiful week. Thank you Sue. 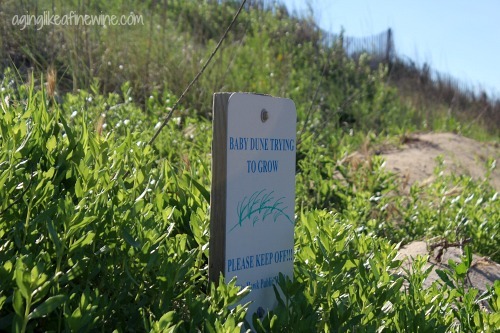 Yes, next time you’re in the US be sure and venture to the Outer Banks! It is one of our favorite places. Thank you for stopping by!